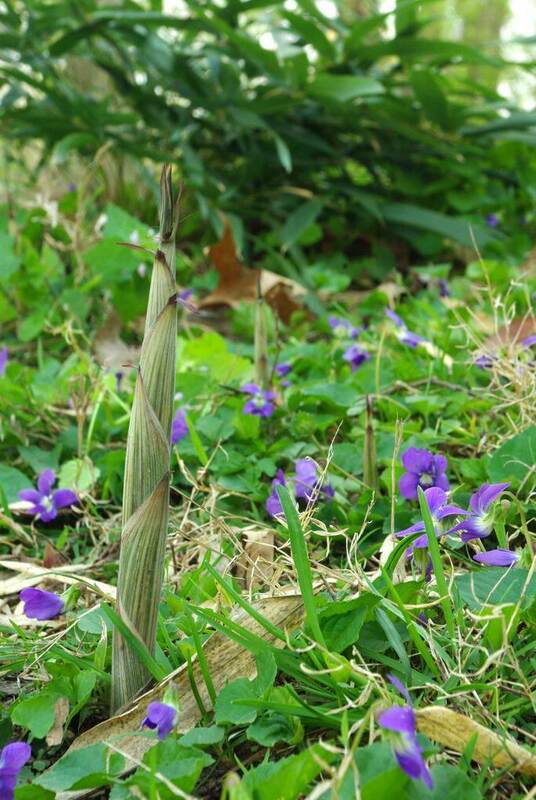 Spring is bamboo shooting season for most temperate bamboos, which means I'm checking my plants for new shoots every day, looking for the first signs of pointy pokings through the soil. I've been watching this one plant in particular, as it was one that I planted 18 months ago but didn't produce a single shoot last year. 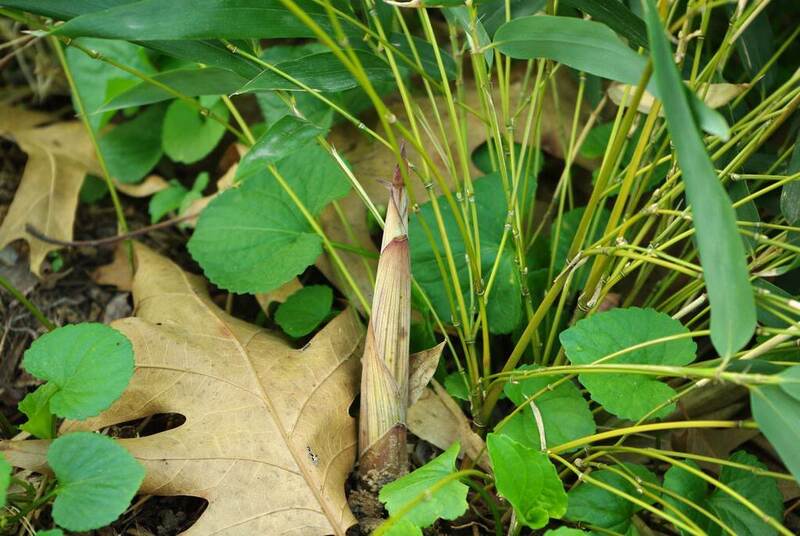 It produced some tiny culms later in the year, resulting in some bushy greenery near the ground in a couple of places. 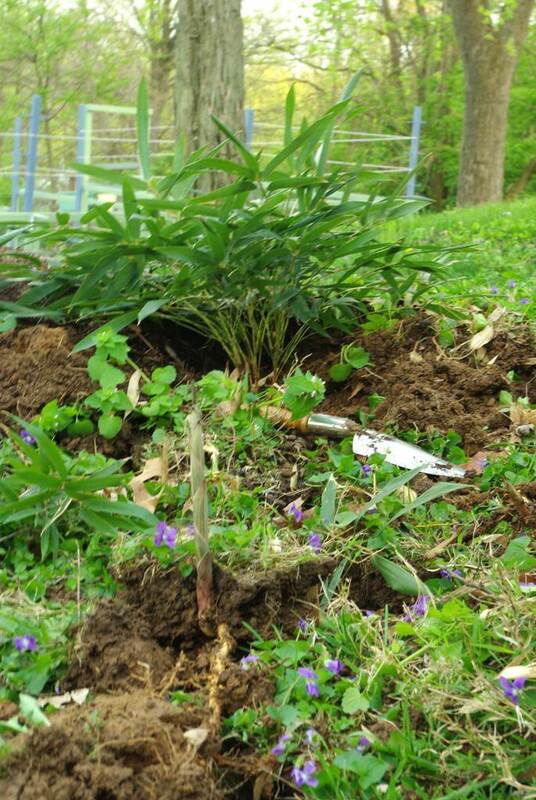 At the time I thought this was strange, and was worried that voles or shrews were nibbling the rhizomes, causing the plant to put up tiny survival shoots. 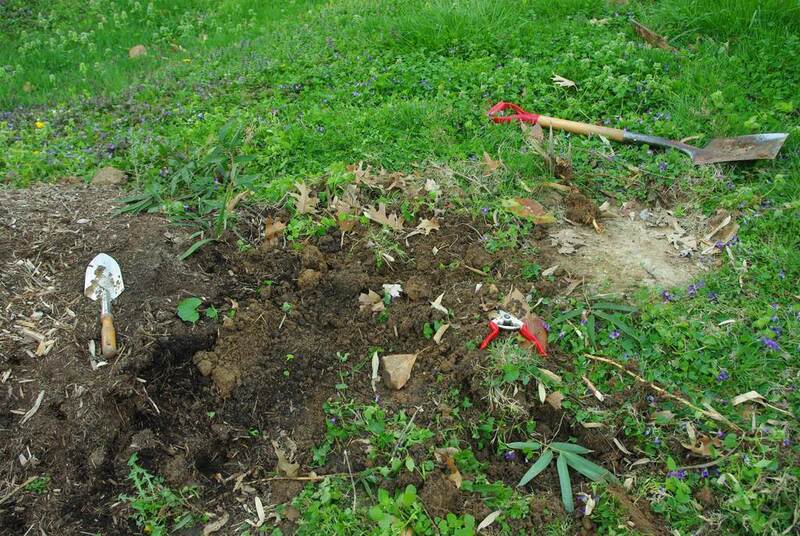 I should have looked more closely at the new growth, as it turns out I don't seem to have a problem with critters damaging rhizomes -- what I have is actually remnant rhizomes from the plant that was in this spot previously. When I removed the Phyllostachys aureosulcata ("Yellow Groove") a couple of years ago, I was worried that I may have missed a couple of rhizome pieces. If I would have been thinking last year I would have realized that the bushy growth must be from these remnants, and I would have removed it. Instead I let these small plants soak up sun and nutrients all summer long -- and now they're shooting! 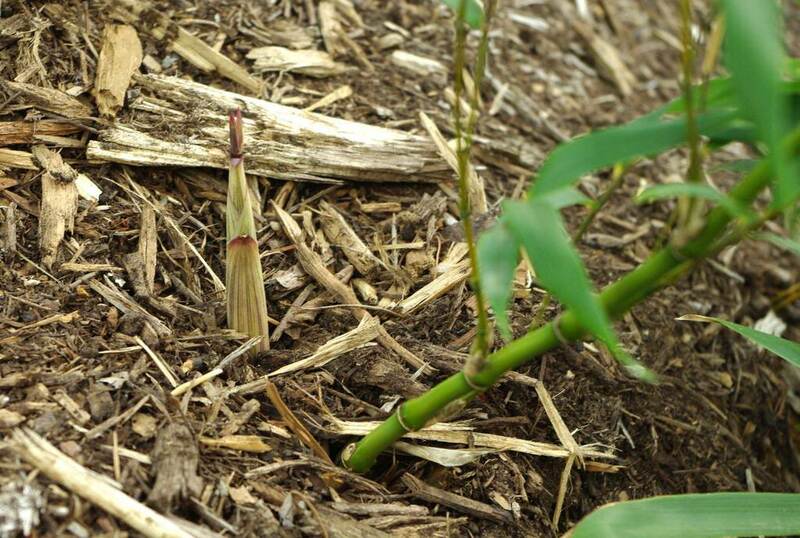 Luckily Yellow Groove shoots much earlier than atrovaginata does and the shoots look much different, so it's pretty easy to know there are two different bamboos growing here. 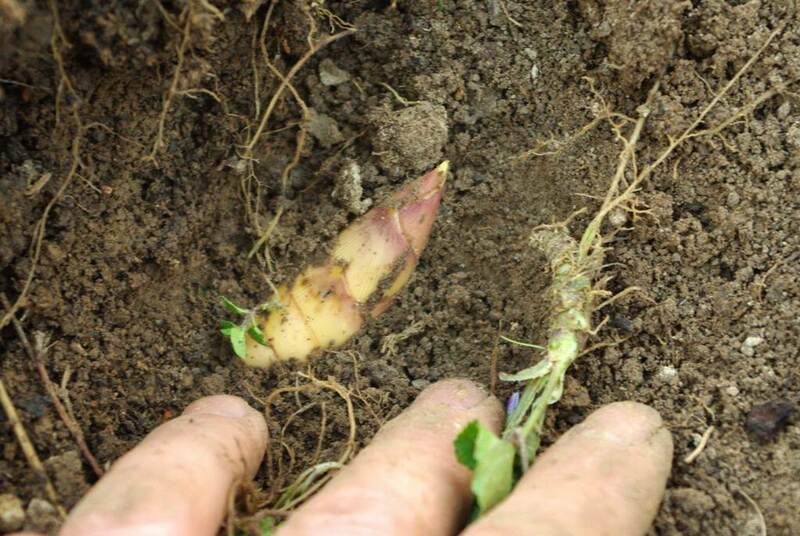 My goal was to dig out these rhizomes, leaving the leafy growth intact to help supply the new shoots with energy, so I started digging. The main rhizome ended up being about 6' (1.8m) long, and there was a second rhizome branch too! 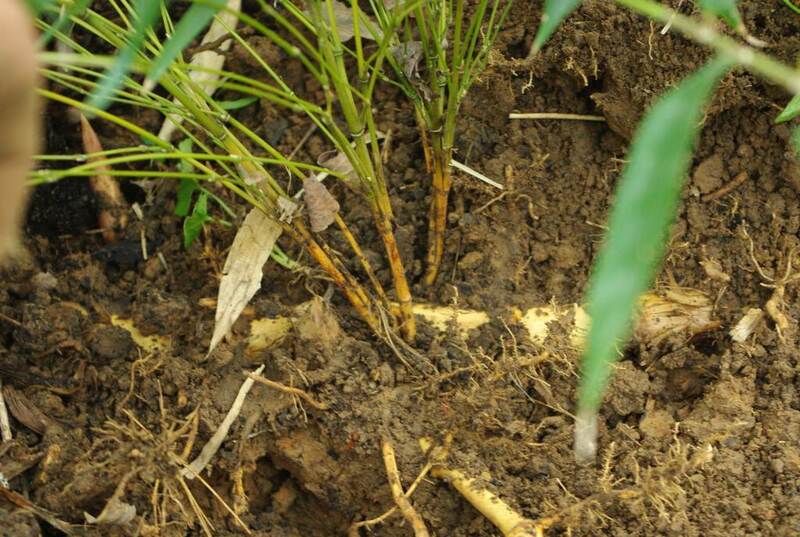 That thick, sturdy rhizome (straight across the middle of the photo) is from the atrovaginata, and has grown over and "locked in" the bushy Yellow Groove culms! Since I don't want to damage the atro rhizome at all, I ended up just removing the leaves and cutting the Yellow Groove rhizome. This is one reason I don't spend too much time fussing with my lawn. The atro is getting ready to shoot! 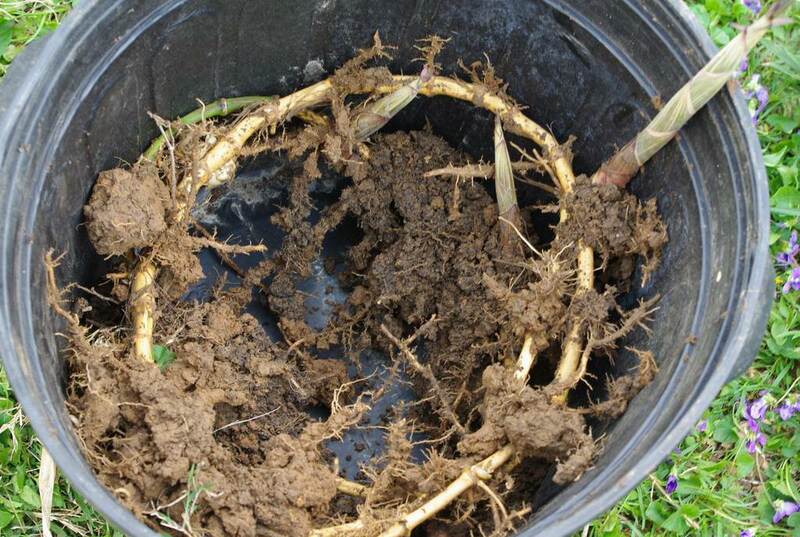 I'm really excited now, knowing the size and extent of the rhizome spread -- this plant is going to produce some beautiful shoots, I just know it! I'm kind of stupid about saving every plant I can, but even I know that sometimes it's just not worth the effort. So there we have it: another lesson about bamboo learned. I think those atrovaginata buds still have plenty of time to swell in diameter. Last year I didn't get atrovaginata shoots until later in May so even if you warm up a month ahead of me, your atrovaginata shoots should still be several weeks away. It will be interesting to see how yours compares. Your atrovaginta culms are about the same size as mine, except I have 2X the number of culms. Wow, these were pretty big shoots from the aureosulcata! Our temps are 10°F below normal so I'm still waiting for my Phyllostachys to shoot. For me nigra is usually the first (I only have a few phyllos anyway and they're all containerized). 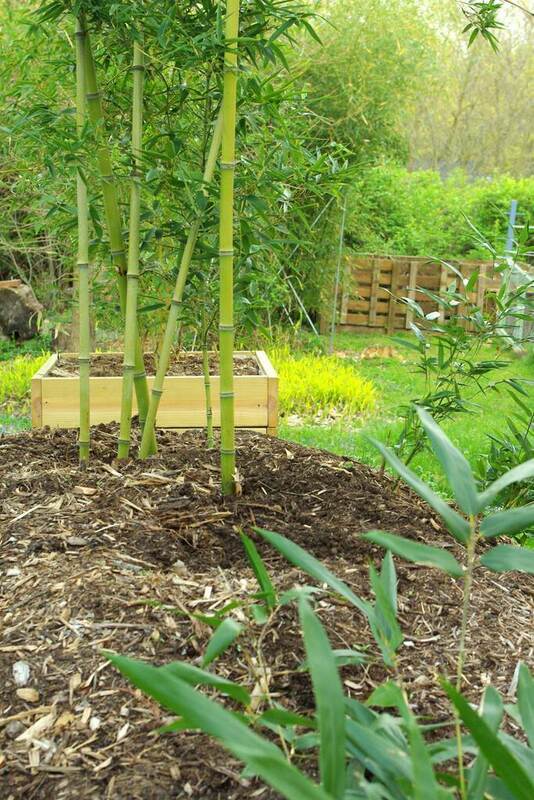 I always love your posts about bamboo! Hopefully you see a lot of action with that atro this year!